Hey dolls! After giving it some thought, I finally decided to participate in the Busy Girl Nails Winter Nail Art Challenge. This challenge is only once a week, so I’m thinking it will be a good way to show at least one nail art look. Sometimes I am completely busy with reviews, so it’s nice to break that up. The theme for this week is teal. Teal polishes are one of my favorite shades to wear, so I was excited for this prompt. I decided to do another horizontal fan brush mani (see first attempt here) using some new and old polishes. The Lady Varnishes is one of the indies I was really looking forward to trying late last year. I purchased one of her polishes during the Black Friday sale and I just love it. The Lady Varnishes The Pirate is a deep teal base filled with silver and gold flakies and blue and silver shimmer. The formula was excellent; it was easy to apply and was opaque in two coats. It does dry to a dull finish, so top coat is needed. The accent nails started with two coats of Zoya Trixie, a silver metallic. Next, I applied a England Saint George and Nicole by OPI Khloe Had a Little Lam-Lam in a horizonal manner using the fan brush. Finally, I added a few brush strokes of Trixie to ensure there wasn’t too much teal. I just love the way this turned out! I ended up using Saint George on my other hand and the colors compliment each other very nicely. This is my type of nail art, simple and chic. 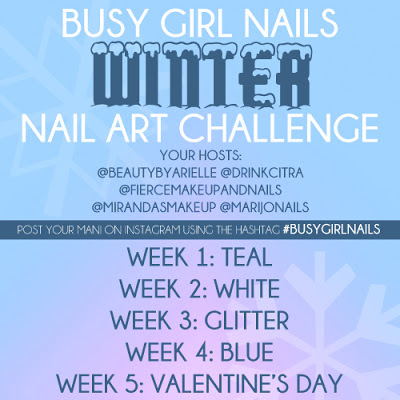 Be sure to check out the other ladies doing this challenge on social media by looking at the tag #busygirlnails. If you’d like to participate, feel free to join us!